Handmade with Love by Sarah: Best Wishes! I'd been thinking about the current sketch at Waltzingmouse Sketch Challenge for several days. I was having a hard time deciding what I wanted to do with it. 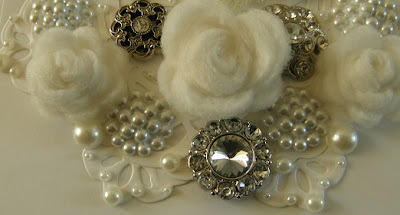 Then I looked at two other challenges, the Bingo challenge at Papertake Weekly, and the Diamonds are a Girl's Best Friend challenge at The Shabby Tea Room, and I knew exactly what I wanted to do: use my Mom's buttons! First, the super cute sketch. I just loved that big flower at the top. 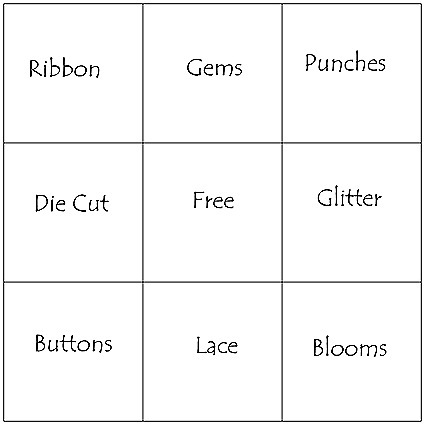 Second, the bingo board for PTW. 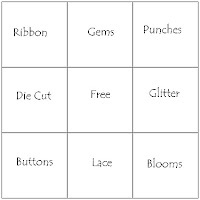 I used the whole board except lace and punches. Finally, the inspiration photo from TSTR. Look at all of those beautiful sparkles and pearls! I started by laying out the various button options that I thought would work. You can see the Marianne doily die that I used underneath all of the buttons as a kind of frame. So I putzed around and tried all sorts of different buttons, and then took a picture of it just in case I knocked it on the floor. I really didn't want to try to lay it all out again! Here's the finished card: The picture is just a little blurry as the camera was fighting to focus. I think the big gem in the bottom button was casting some glare that didn't help matters. I added mini pearls all around the edges of the doily as a finishing touch along with a few pearls scattered throughout the design to fill in some of the empty space. 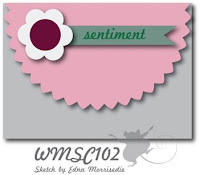 I used a second doily die cut (one from Stampin' Up!) to fill in the space between the buttons and flowers. I used a wire cutter to snip off the shanks on the buttons before I glued them in place. The 2 smaller flowers above are made using a scrap of Warm & Natural 100% cotton quilt bat with the rolled rose die from My Favorite Things. 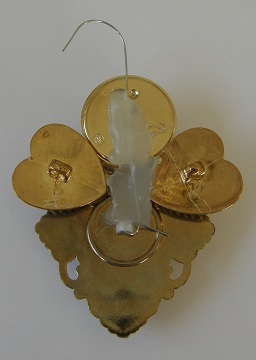 The larger center flower is made with a Sizzix die using the same batting. Mom left a paper box (the ones that come with 8 reams of 8 1/2" x 11" paper) FULL of these lavish buttons. 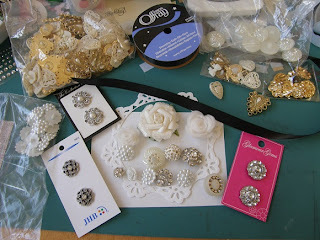 She had planned to make a whole bunch of button angels for Christmas tree ornaments. They are so quick and easy to do, and it is so fun to pair up the different buttons and look at all of the possible combinations. Ariel and I are going to work our way through this button box at some point before Christmas (I hope!). She can be in charge of layouts, and I'll run the hot glue gun. This angel is about 4" tall including the hook. Here's what the back looks like to give you an idea of just how quickly these angels can be assembled. First glue the head and wing buttons in place, and then add a hanging wire on the back. 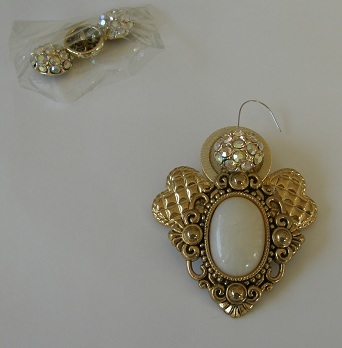 If you decide to try this project, these ornaments can be quite heavy depending on the size of buttons used, so make sure you get a lot of glue in there to hold it all together! Stamps: Waltzingmouse Stamps: "Fancy Phrases"
WOW!!!! So exquisite! Love how you showed us your process to get your finished result! Oh Wow is that ever beautiful, what a wonderful idea with the quilt batting and the angel is so sweet too! 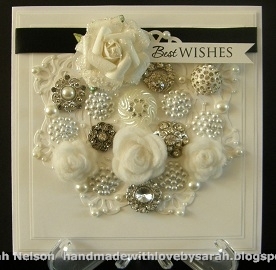 Wow...what a beautiful use of those vintage button treasures...this is a lovely card! Absolutely glamorous! Perfect take on the challenge! 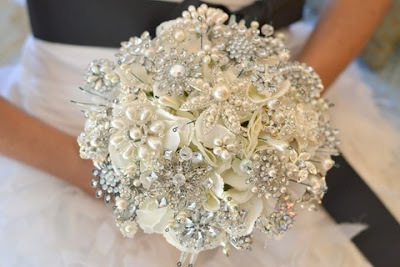 Love all the buttons and bling on your card...exquisite! Take care and have a wonderful weekend! gorgeous in the soft ivory and black!